On June 1st is World Milk Day. For making the Foundation for Animal Welfare FOUR PAWS on the suffering of dairy cows attentively. Because with the romantic notion of many people from grazing cows has little to do with today’s dairy products: milk and milk products originate mainly from cows that have been bred for extreme power and can stand on a pasture not once in her entire life. FOUR PAWS demands a rethink: healthier animals with longer life and a ruminant-friendly housing. In Germany the average annual milk yield is 8,300 kg per cow, and it even gives cows give 12,000 kg of milk. 40 years ago there were only about 2,700 kg. The negative consequences of conventional production conditions in Germany are varied: The oversized udders are often inflamed (mastitis) and prevent the animals to move normally, as well as ill-mouth smooth and stable floors. 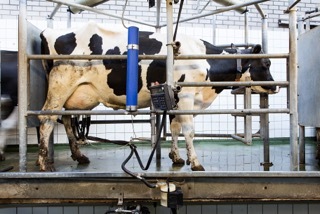 In Germany suffer 30 to 50 percent of dairy cows to lameness. While there are compared to the past more playpens for dairy cows, but fewer and fewer cows come to the pasture. Many animals also get to increase the output further concentrated feed, which is not species level for ruminants. While numerous diseases of dairy cows has risen sharply in recent years, taking the “useful life” of the cows dramatically. The emaciated cows are often slaughtered at the age of five years – the natural life expectancy of a cow lies in over 20 years. Main “leaving Cause”: fertility problems. Because to give milk, a cow calf must get at least a year, which is taken from her normally immediately after birth. Will she not become pregnant or are too little milk, she comes to the slaughter. What a sad life! Drinking milk consciously, spend some extra money and buy organic milk, which also helps. The Demeter Bio-label has established in its guidelines as the only organic brand, that the cows keep their horns. This is a particularly good criterion, because first it means the milk of cows horned should be better, and better tolerated. Secondly, there is the cows with horns probably better. Until now it has not been proven scientifically, what for the cows need their horns. But it is clear that normal dairy cows as Simmental and Holstein Friesian are born with horns. 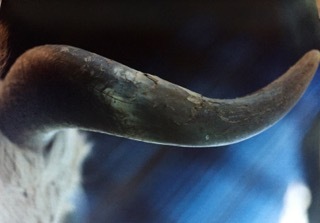 A connection to the digestive tract of the cow, although not scientifically proven, can begin to develop, however, because the horns start to grow significantly in the moment when the calf begins to take green fodder to be. The horns to remove the calf, has proven extremely painful for the calf. In the new June issue, the Eco-Test magazine milk substitutes like soy, rice, oats, spelled and almond drinks took a closer look. The result is pleasing for the most part: Almost half of the products overlap with “good” or “very good”. However, the lab was able to prove chlorate in some drinks, as genetically modified organisms in soy drinks. Whether ethical concerns or lactose intolerance, there are good reasons to cow’s milk to dispense. Öko-TEST are some interesting products on the market. However, not all who study the consumer magazine in the laboratory has made a clean slate: So were detected traces of genetically modified organisms in six of eight soy drinks, unfortunately, in some organic products. ÖKO-TEST advises therefore: Who wants GMO-free 100 percent milk substitute, should resort to cereal-based beverages. Also chlorate is an issue in dairy substitute products. More than half has values ​​of any substance which may inhibit iodine uptake thyroid temporarily and damage the red blood cells. Chlorate is a typical disinfection byproduct or passes through the irrigation on the field in the food. In milk substitutes also the drinking water comes as an entry source in question, as many water utilities prepare water with the aid of substances such as chlorine gas, whereby chlorate can form as a byproduct. The (Öko) Eco-Test magazine in June 2015. The booklet costs 4.50 euros.